Apple Announces Notebook Event For Next Week | OhGizmo! By Chris Scott Barr on 10/10/08 • Leave a comment! I’ve been in the market for a new notebook for a little while, and have been trying to decide between a cheap netbook like an Inspiron Mini, or a Macbook. While I’ve always been a fan of Apple’s product line, it is a bit pricey. 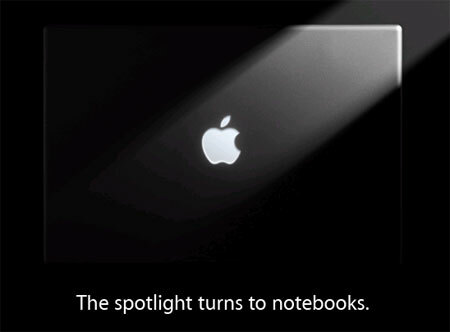 However, they have announced an even next Tuesday (October 14th) where they are going to discuss notebooks. The rumor mill has been hard at work lately, and signs point to a new Macbook that will start out in the $800-$900 price range. While Apple’s share of the laptop market has been steadily growing, this would make their notebooks more appealing to those not wanting to spend a grand on a computer. We’ll keep our eye out and let you know if anything interesting is announced.